A festering mass of thunderstorms in the southwestern Caribbean has gradually become better organized and was declared the 16th tropical depression of Atlantic hurricane season Wednesday morning by the National Hurricane Center. The depression is likely to become the season’s 14th named storm, called Nate, very soon. The depression could strengthen substantially over the coming days and make landfall along the U.S. Gulf Coast between Louisiana and Florida’s west coast late Sunday as a hurricane. New Orleans, Mobile, Ala., Pensacola, Fla., Apalachicola, Fla., and even Tampa are among population centers the system could directly impact. Currently centered east of Nicaragua, the depression is expected to drift northwestward near the coastline of Nicaragua and Honduras Thursday, where tropical storm warnings are in effect. Rainfall totals of 15 to 20 inches, with locally higher amounts, are predicted in parts of Nicaragua. On Friday, computer models forecast it to pass over the Yucatán Peninsula, near Cancun, or just to the east through the Yucatán Channel (between the Yucatán Peninsula and Cuba). It should reach the Gulf of Mexico by late Friday, and pick up speed as it moves northward or northeastward Saturday. By Sunday, it is likely to be bearing down on the Gulf Coast. Because the system may interact some with land, including Nicaragua and Honduras, and then perhaps the Yucatán Peninsula, the intensity forecast is very difficult. However, there is some potential for it to intensify rapidly. The sea surface temperatures, which serve as fuel for tropical weather systems, are very high from the southwest Caribbean to the Yucatán Channel and into northeastern Gulf of Mexico — generally 0.5 to 2 degrees above normal. Furthermore, ocean heat content, a measure of the depth of warm water, is also very high in this region — the highest of any part of the Atlantic Ocean basin. Vertical wind shear, which can disrupt storm development, is not high — another factor in the system’s favor. Given all of these factors, it is almost a given that this will become a tropical storm; the question is where the ceiling lies for its strength. “Rapid intensification is a possibility over the northwestern Caribbean or southern Gulf of Mexico while the system is traversing rather warm and deep waters, although it remains to be seen how separate the depression becomes from a larger gyre over central America,” the National Hurricane Center said Wednesday. Models mostly do not predict this to become a hurricane — they mainly cap it at a strong tropical storm — probably because of interaction with land and perhaps some dry air feeding into the system. However, the National Hurricane Center’s official forecast is for this depression to make landfall along the Gulf Coast as a Category 1 hurricane Sunday. 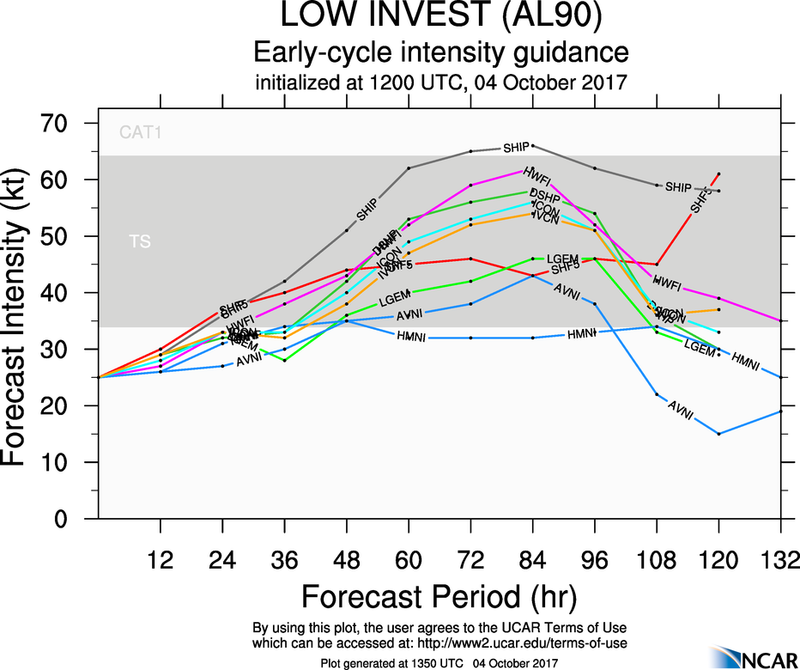 Expect this intensity forecast to evolve as the system develops and models and forecasters get a better handle on how it is interacting with the environment. The track forecast is more straightforward but, as usual, the devil is in the details. Both European and American model groups show the depression reaching the southern Gulf of Mexico Friday, but then they diverge. The European model turns the system more toward the right into the big bend area of Florida’s Gulf Coast, while the American model steers the system north-northwest toward New Orleans. The exact timing of a cold front sweeping toward the East Coast will be a huge factor as to the landfall location. A speedier cold front would push the storm farther east toward Florida. Alternatively, a slower front would allow the storm to travel more due north toward Louisiana on the western periphery of a large area of high pressure over the western Atlantic Ocean. Interests from the Louisiana-Texas border to southwest Florida should carefully monitor this system. After probably making landfall Sunday, the depression should get drawn northward into this front charging toward the East Coast. Heavy rain could surge up much of the Eastern Seaboard from south to north between late Sunday and early Wednesday, from south to north. Amounts may be held somewhat in check because it should move through quickly, but several inches could certainly fall in some or many locations. National Weather Service 7-day rainfall forecast. The development of this depression is occurring in the region most conducive to storm formation at this time of year. Historically, most October hurricanes have been born in the far western Caribbean Sea. As credit to the skill of American and European long-range forecast models, recall this is the same system we discussed in last Thursday’sarticle: “The European and U.S. long-range models are hinting at a possible development in the southwestern Caribbean and then a track toward the north, which would bring the system toward the Yucatan and Cuba in about 10 days.” Six days have elapsed since that outlook, and it seems right on track. Nate, assuming it forms as predicted, is a storm name that is still around from its inception on the list of storms in 1981. It was used in 2005 and in 2011, but has not yet been retired.